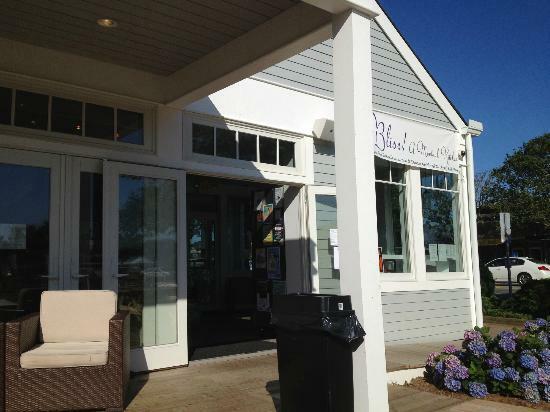 This eatery is situated right in the heart of Montauk. It is a simple kitchen without table service but they do have indoor seating and a large eating area outdoors with picnic tables and umbrellas--great for relaxing and enjoying the weather. Some days they have live music but that wasn't the case when we were there. The menu offers much to choose from consisting of small plates, sandwiches and paninis, burritos and tacos, their specialties and breakfast (only egg sandwich and burrito available all day, the regular breakfast menu is from 6am-11am). We ordered the fried calamari, fish and chips and the L.I.B. (a steak burrito). We were sitting outside at one of the tables so one of the workers brought the food out to us which was nice and unexpected. We were initially surprised with the way the calamari looked because it was in strips instead of the classic rings, but they had to be some of the best calamari we've had! They were seasoned and fried to perfection. Our toddler couldn't eat them fast enough either! The fish and chips was a very large portion. The fish was nicely fried and it came with a ton of shoe string fries and a delicious tarter sauce that tasted like it was made fresh. The burrito was also good; very filling but the steak could have used some more seasoning. The menu says "garlic, lime and red chili marinated steak" but it didn't taste marinated at all. However, the guacamole on the burrito was delicious! The prices were pretty on point with what you'd expected from Montauk. There wasn't that much of a wait, the food was good and its super casual. Definitely a place we'd go to again!